I was in one of those outlet stores the other day. It was a Bealls outlet, a popular retail store in Florida. They pronounce it “Bells” – but not me. I learned to read using phonics, to sound out words, and Bealls isn’t Bells to me. I don’t pronounce meals as mells – or deals as dells. So, though I know it’s not correct, I’m sticking to pronouncing it my way, knowing every time I do, I’ll be corrected. Anyhow, on the men’s super-discount rack, which is where old coot’s shop, was a nice-looking, unusual pale yellow, Columbia fishing shirt, in the XL section of the rack. A fifty – or sixty-dollar item marked six bucks. I was going to grab it and run (to the cashier), but decided to try it on, for a change. It didn’t fit; the sleeves came well above my wrists and it felt tight across my shoulders. I quickly slipped it off and returned it to the rack, but I put it in the “medium” section, thinking it had been mislabeled. Darn! It was such a good buy. I mentioned it to my wife, who is a super smart shopper. She asked if the buttons were on the right or left. I didn’t know; I hadn’t tried to “button it” – “Well,” she continued, “If you did, you might have seen that they were on the “wrong” side, that it probably was a woman’s shirt. Unfortunately, it was a question I couldn’t answer. But, the bigger question that came to me was, “Why are the buttons on men’s and women’s clothes on opposite sides. Finding the answer turned into a history lesson. Buttons came into use in the 13th century; they were fancy and expensive, so only wealthy women could afford them. Wealthy women didn’t dress themselves, as you would know if you watched Downtown Abby or The Crown; a lady’s maid dressed them. Since most people are right handed, lady’s maids as well, the buttons were sewn to the left placket, making it easier for them to fasten. And to this day, that’s where they remain. Buttons on men’s clothes, back then, were mainly found on military uniforms; soldiers dressed themselves, so the buttons were located on the right placket, easiest for right hander’s buttoning from inside the shirt. Since women, from an early age, generally outshine boys in the dexterity department, it’s never been much of an issue for them that the buttons are on the left side. But, put a man in a woman’s shirt, if you want a chuckle, and watch him struggle with the buttons. (Unless he’s left handed). Lefties have always gotten short shrift from society on mechanical devices. Try to cut paper left-handed with a pair of regular scissors and you’ll understand. Left-handed maids and soldiers were “left” out in the cold, so to speak, in the 13th century and not much has changed since then. Man! I wanted that shirt! 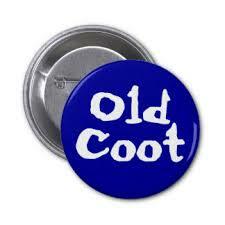 Be the first to comment on "
The Old Coot buttons up a mystery"